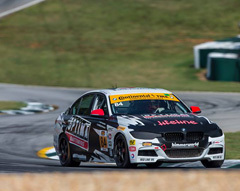 Tyler Cooke of Matthews, N.C. put BimmerWorld Racing’s No. 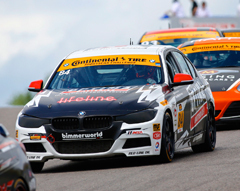 84 OPTIMA Batteries BMW 328i on the pole for Friday’s IMSA Continental Tire SportsCar Challenge race at Circuit of The Americas (COTA), but the car developed a misfire as soon as the race started. He only completed a dozen laps in the 2.5-hour race, so Cooke’s co-driver, James Clay of Blacksburg, Va., could do nothing but prepare for a meal at his favorite Mexican restaurant in the Austin area prematurely and hope for better luck at the season finale on Sept. 30 at Road Atlanta. Jerry Kaufman of Mooresville, N.C. and Kyle Tilley of Bath, England started 14th in class and ended up 12th in the No. 81 BimmerWorld BMW 328i, completing 57 laps. Kaufman was 12th when he pitted on lap 24 for the driver change, but the No. 81 drew a penalty during the pit stop that forced Tilley back to 21st for the beginning of his stint. There was only one full-course caution at the very beginning of the race, but the team persevered through the hot Texas sun and a greasy track to climb back to 12th at the finish. The No. 81 was aided by good race strategy, as Tilley saved fuel and gained three positions at the very end when some of his competitors ran dry. “I’m super-disappointed that the No. 84 car qualified on the pole and then immediately had a miss on the out lap; I’m not super happy about that. “We had a little bit of a misfire during the pace lap, and it proceeded to get worse and worse. By the time we took the green flag, the misfire got so bad it wouldn’t produce power going into Turn 1. That got pretty hectic pretty fast. I can’t thank the guys enough. They busted their butts. Every time we came into the pits we’d change some stuff and go back out, [and then] we’d be fine for a lap and it would start to do it again. “It was good. We were unfortunate to get a drive-through penalty. If we hadn’t had that, I think we would have had a good result. [About the penalty] Jerry knocked the car in gear during the driver change, so the wheels spun up on the jacks. That’s all right. It’s just one of those things that happen. We’ll evaluate what we can do differently on our driver changes for the next time out and go from there. Considering I didn’t manage to do any laps in practice, I’m relatively happy with our race. That was about all the car had. The guys did a great job to recover from two pretty bad days of practice to get a car out there for the race. It was good. I’m happy with it and looking forward to Road Atlanta. “This was my first time racing in Texas, and the legendary heat didn’t disappoint. It was pretty amazing how the car felt almost exactly like it did at Sebring. It’s good that we got to drive there and got to experience that, and we were able to adjust. By the time I figured out what to do, it was a little late. With all this extra heat, we were losing power with our turbo motor. The Continental Tire SportsCar Challenge race will be broadcast on a tape-delayed basis on FOX Sports 1 on Sunday, Sept. 25 at 5 PM Eastern time. The season finale will be held on Friday, Sept. 30 at Road Atlanta in Braselton, Ga. 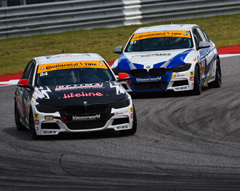 Round 8 of the IMSA Continental Tire SportsCar Challenge (ICTSC) was the Oak Tree Grand Prix at Virginia International Raceway (VIR) on Saturday. The two-and-a-half-hour event turned out to be a wet and wild race that started in dry weather before a major thunderstorm blew in and brought out a caution after 31 minutes. That was followed by a 52-minute red-flag delay to wait out the buckets of rain and lightning that moved through the track that borders the Virginia/North Carolina state line. When the race restarted under caution, the 36-car field had shifted plenty when many cars experienced off-course excursions through hydroplaning. The final 23 laps were run under green and provided abundant action on the 3.27-mile, 17-turn scenic road course. Both the No. 84 OPTIMA Batteries BMW 328i team of James Clay and Tyler Cooke and the No. 81 BimmerWorld BMW 328i of Jerry Kaufman and Kyle Tilley were excited to be competing on the BimmerWorld home circuit, as their race shop is only about 100 miles away in Dublin, Va.
James Clay qualified the No. 84 BMW on the front row in the second position on the grid in the Sports Touring (ST) class for the two-hour-and-thirty-minute race. A small post-qualifying inspection infraction sent the team to the rear for the race start. Clay drove smart through the rainy conditions and made quick work of pacing through the field up to seventh place on his favorite home track. However, a fuel hose left out on pit lane got in the path of Cooke during his driving stint and dropped them back, but he managed to bring the F30 home in P13. The No. 81 BMW of Kaufman, who qualified and started 19th, took advantage of missing the initial fray by the leaders when the weather rolled in and kept the BMW on track. His teammate, Tilley, who enjoys wet weather racing, also drove smart and took the F30 to the checkered flag in the 21st class position. Because of the unexpected and intense weather, regular pit stop strategy was thrown out the window and it was a matter of keeping the BMWs on track and bringing the cars across the finish line. To add to the race drama, the official IMSA timing and scoring failed in the extreme weather conditions and final scoring had to be completed manually and audited post-race before results became official. The television broadcast will be aired on FOX Sports 1 on a tape-delayed basis on Sunday, September 4 from 10:00 AM-12:00 PM EDT. The next race, Round 9 of the Continental Tire Challenge, will be held at Circuit of The Americas (COTA) on Friday, September 16. 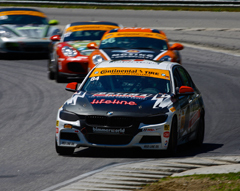 Hot temperatures and caution-free conditions were the themes of the IMSA Continental Tire SportsCar Challenge race yesterday at Lime Rock Park. The short but fast “classic” layout on the 1.53-mile, seven-turn northeastern Connecticut circuit was a challenge for the two-hour and 30-minute 150-lap race, which saw Mazdas dominate the Street Touring (ST) class podium. The No. 84 OPTIMA Batteries BMW 328i of starting driver James Clay and co-driver Tyler Cooke began the race from the fifth position on the grid and struggled a bit with the heat and tire preservation on the greasy track. However, they were able to manage their fuel economy to run in the Top 10 all of the race. As the race went on, the duo did their best to maintain position, manage the heat inside the cockpit and push the F30 chassis to the limit under trying conditions to finish in sixth place in class. The No. 81 BimmerWorld BMW 328i of Jerry Kaufman, who qualified the car in the 19th class position, and co-driver Kyle Tilley, advanced their BMW to 14th position at the checkered flag, despite a challenging race start. Feeling comfortable with the car setup, Kaufman clawed his way back up through the field after losing several positions early in his stint. Tilley had to manage a brake pedal issue, which proved particularly challenging in the first corner, despite having an otherwise good BMW race car with plenty of speed. “We started off with a pretty good car. The team’s done a really good job working their butts off, and I couldn’t be prouder with a Top 10. We just had nothing at the end for the top guys. The Miata MX5s lapped the entire field, so that’s unreal. That’s not even remotely close to anybody’s pace which just blows my mind. This [Lime Rock] is an okay track for us, so a Top 10 is perfect, but we’re happy to be heading into Road America next, which is a good track for us. The television broadcast of the Continental Tire SportsCar Challenge race will be on FOX Sports 1 on a tape-delayed basis on Sunday, July 31 at 12 PM EDT. The next race, Round 7 for the Continental Tire Challenge, will be held at Road America as part of the Continental Tire Road Race Showcase on Saturday, August 6. 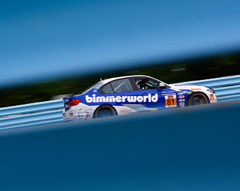 Surviving a first-lap melee and hard charging drivers were key components to BimmerWorld Racing’s two Top Ten finishes in the IMSA Continental Tire SportsCar Challenge race at Watkins Glen International today. Round 4 of the 2016 Continental Tire SportsCar Challenge boasted a field of nine Grand Sport (GS) and 27 Street Tuner (ST) class entries on a gorgeous summer day in the Finger Lakes Region of upstate New York. However, a storm of cars collided on the first lap and sent numerous cars to the pits for repairs. Starting driver Tyler Cooke, who was competing with a broken wrist, in the No. 84 OPTIMA Batteries BMW 328i avoided the early fracas but had a minor contact with a Porsche Cayman, yet still drove to the lead. After a restart, traffic clustered together and the challenge was on to keep the tires at optimum capability while battling for position. James Clay was able to bring the BMW home in sixth place, an impressive finish that saw Porsche Caymans dominate four of the top five position at the 3.4-mile, 11-turn road course. Jerry Kauffman and Kyle Tilley, drivers of the No. 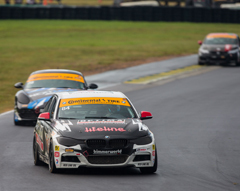 81 BimmerWorld BMW 328i, saw their best finish of the 2016 season when they crossed the finish line in 10th position in the two-hour and 30-minute race. A strong performing F30 car and heads up driving by both racers permitted the duo a strong performance in a challenging race for many competitors. The Continental Tire SportsCar Challenge race will be broadcast on a tape-delayed basis on Fox Sports 1 from 9:00 a.m. to 11:00 a.m. EDT on Sunday, July 10. 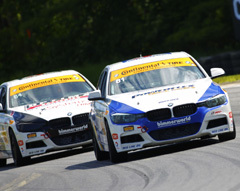 The next event, Round 5, is next week, July 8-10, at Canadian Tire Motorsports Park (Mosport) in Bowmanville, Ontario.